In honor of Women’s History Month, the Business Resource and Innovation Center is hosting an innovative and inclusive job seeker event in partnership with Strategy Arts and WOMEN’S WAY. “Breaking Barriers” turns the “Job Seeker” event upside down! Instead of employers exhibiting their organizations, this event will empower women to break down the business practices that are creating inequities for women job seekers and to speak about their strengths as potential employees. Best Practice Forums are a series of workshops from SBN that use member case studies to create meaningful opportunities to learn, connect, and build a better business. This panel discussion will discuss how local, independent businesses can finance values-based growth. The panel will be moderated by Heather Hanowitz of PIDC and will feature a mix of finance professionals and business-owners with lived experience in scaling up their business. Join the WURD Family for our first ecoWURD event of the new year. On Saturday, March 2, 2019 we’re partnering with Green Philly to host a panel discussion and resource fair focused on “The Future of Work in Philly's Green Economy.” If you or someone you know is looking for new job opportunities in the new economy, you will want to come out. Hosted at the Pennsylvania Academy of the Fine Arts located at 128 North Broad Street, the event will run from 11am to 1pm with doors opening at 10:30. Join the Philadelphia Professional Net Impact Chapter at our Annual Members Meeting and Informational Session at SPIN Philadelphia! This Informational Session will give an overview of who Net Impact Philly is, and what we do. Additionally, the Annual Members Meeting brings together our Chapter's Board and members to review the previous year, discuss the upcoming year, and identify ways for our members to get more involved. Members can provide feedback on our programming and plans so that we can continue to add value to your membership and build on our successes. The labor market is an ever-evolving landscape that can be difficult to navigate from one decade to the next or even year to year. Join The Chamber in their morning session that will include a keynote speech and panel discussing strategies to address hiring needs and barriers. The goal of the event is to teach local business leaders creative approaches to workforce development such as apprenticeships, industry partnerships, and worker training from leading industry experts. The Greater Philadelphia Innovations Awards celebrates 10 years of showcases the area’s best and brightest ideas put in action. The theme of the 2019 awards, "Innovating Ideas, Revolutionizing Realities," recognizes organic leadership re-envisioning the challenges communities face and finding solutions by innovating ideas to reshape communities through innovated programs, policies, and disrupting the political landscape to revolutionize realities to bring us all forward to a more equitable and inclusive tomorrow -- today. You have questions and Green Philly Blog’s “How Sustainability Works” seminar has answers! Register to attend the insightful event that will discuss how processes work and how to be more environmentally friendly in areas such as green energy, agriculture, brewing, and hemp fabric manufacture and use. Industry experts will be on hand to discuss and explain how they are tackling their unique green problems in their respective fields. If you are interested in becoming a learned conscientious consumer, then this event is for you! Join the Chamber of Commerce of Greater Philadelphia as they toast to the city’s excellent mid- and small-size businesses. This year’s line-up of awards includes the ImpactPHL award, given to a local organization each year that embodies the mission and drive of our area’s many impactful institutions. This is the third year that ImpactPHL has partnered with The Chamber to highlight the year’s outstanding impact maker in the city. Past winners include Solar States LLC and Message Agency. This year’s ImpactPHL Award is proudly being bestowed upon Jumpstart Germantown. The Chamber of Commerce for Greater Philadelphia is pleased to announce a new half-day conference it is hosting. The goal of the morning forum is to highlight the budding areas of current and potential growth in Philadelphia neighborhoods, and connect the business leaders in some of these market segements to community leaders. Economic growth and job creation should be benefits to neighborhoods as a whole, and The Chamber aims to get the right people in the room to learn and discuss how to make that a reality. Investors’ Circle-Social Venture Network builds and serves communities of inspired and informed impact investors and business leaders to make social, economic, and environmental change. IC-SVN’s unique conference experience creates an environment where the real challenges, insights, and best practices of leading mission-driven businesses and engaging in impact investing can be discussed and put into action. Join Sustainable Brands as they bring their world wide renowned event tour right to our back yard in Philadelphia. This exciting event entitled New Metrics boasts over 300 professionals that will gather for insights, inspiration, and collective conversation about how businesses can measure environmental & social impact in previously unexplored ways. SOCAP is the world's leading conference on impact investing and social enterprise. Held in San Francisco, SOCAP18 will unite innovators in business, tech, the sharing economy, health, philanthropy, and more to advance environmental and social causes. Calling all aspiring impact entrepreneurs! Seed Spot’s 2-Day Launch Camp in Philadelphia could be exactly what you are looking for to help get your idea off the ground. The 2-Day Launch Camp provides entrepreneurs and individuals that are exploring starting a venture a safe space to explore and launch their idea. Throughout the two day program and indefinitely thereafter, you will have access to mentors, content experts, Seed Spot's curriculum, and a network of supporters. Where are there opportunities to improve economic mobility for low-income residents of the city or those living in low-income communities? How can business, finance, and the “impact economy” spur economic growth and also tackle the root problems of systemic inequality? What can we learn from allies working across sectors in sustainable housing, jobs, workforce development, and grassroots organizing to collectively build a more equal and prosperous society? Register today for Social Innovations Journal’s October exciting webinar. They have tapped experts from around the world to discuss their perspective of the investment and business world and how it they are aligning themselves with the ideals of social impact. As the Journal puts it, as businesses begin to blur the line between for-profit and not-for-profit organizations, so too are investors beginning to demand their portfolio be a force of social impact as well. Attendees to the webinar will be privy to an inside view of these trends and developments. Total Impact Boston will convene investment advisors, wealth managers, and investors who want to gain actionable and executable information on impact investment. In addition, in partnership with key Boston stakeholders, Total Impact will highlight place-based opportunities and the impact success stories of the greater Boston area. 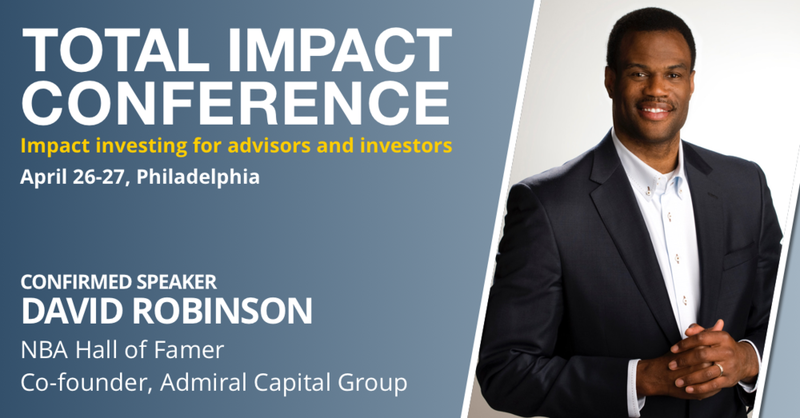 Friends of ImpactPHL can save $250 - Use promo code TI_IMPACTPHL when registering. This biennial conference, co-hosted by the Philadelphia Fed, will explore strategies to best leverage different forms of capital to help neighborhoods and individuals reach their full potential and to share in the value-creating vitality that is the U.S. economy. This year, for the first time ever, there will be an track specifically for impact-driven ventures at the Philadelphia Alliance for Capital and Technology’s Capital Conference. Join the Chamber of Commerce for Greater Philadelphia for their event this September regarding the enhancement of Philadelphia's commerical corridors. Hear perspectives from real estate developers, community advocates, corridor managers, and business owners on how positioning these corridors for success can bolster prosperity in our communities and stimulate economic growth for our city. This symposium brings attention to the value of mission-aligned investments as a method to advance community impact for public-private partnerships, foundations, social investors, and nonprofits. Mission-aligned investing is a practice whereby funders and social investors make investments beyond grantmaking and charitable giving to advance social impact that is aligned with their mission. Additionally, this symposium will officially present Philanthropy Network’s efforts to advance the practice of mission-aligned investing in our region. Join The Citizen for an evening with Anand Giridharadas, author of the provocative new book, Winners Take All: The Elite Charade of Changing the World, and Jay Coen Gilbert, co-founder of B Lab, the nonprofit behind the international B Corp movement of using business as a force for good. It promises to be a compelling, even controversial, discussion. Best Practice Forums are a series of workshops from SBN that use member case studies to create meaningful opportunities to learn, connect, and build a better business. The conversation of this forum will focus on the business perspective around reducing energy and how local businesses can lead the region towards a more energy efficient future. Before Summer slips off into a memory, we're going to convene for a summertime social co-hosted by SOCAP365, ImpactPHL, and Investors' Circle / Social Venture Network. Put the date on your calendar now. You won't want to miss this! Join Net Impact Philadelphia as they host a round robin discussion with two of Philadelphia's most innovative impact business leaders, MilkCrate and B Lab. Representatives from the two organizations will be available to discuss the growth of their respective enterprises from ideation to the fully-fledged social impact businesses they are today. Join Green Philly in their annual effort to celebrate the city’s standout sustainabiity stars. Be inspired by local heroes. Support sustainability in Philly. Attend the SustaInPHL Awards, an annual celebration for sustainability visionaries to unsung heroes making a difference in Philadelphia.